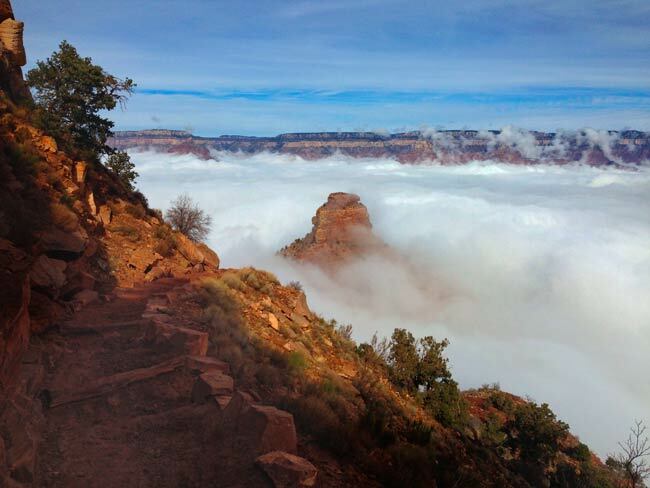 Last week, Grand Canyon was awash in clouds thanks to a phenomenon known as an atmospheric inversion. 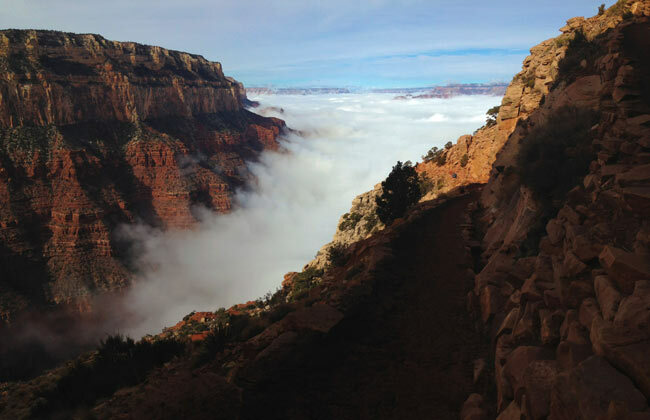 During an inversion event, the canyon can trap within its walls a layer of clouds stretching from rim to rim. 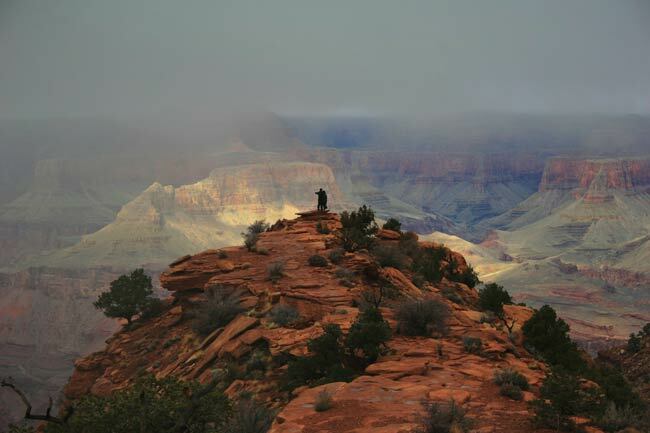 Over the course of the week, the cloud layer appeared, disappeared, and reappeared — and the mood of the canyon changed dramatically. I hiked into the canyon on two different days (Wednesday and Saturday), and shot some photos. Here are a few of those photos, along with commentary. 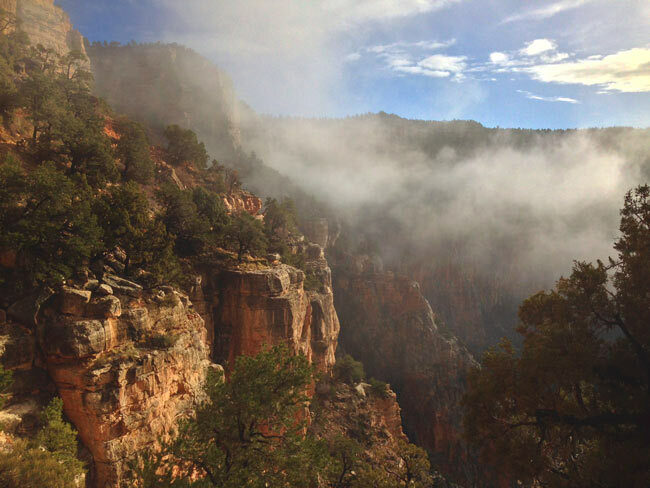 On Wednesday, the clouds were nestled relatively deep within the canyon — at times, about one third of the South Rim walls were visible above the cloud ceiling. The South Kaibab Trail spends its first mile or so traversing the upper layers of Pipe Creek Canyon. The clouds thinned out in the upper reaches of the side canyon, as shown here. 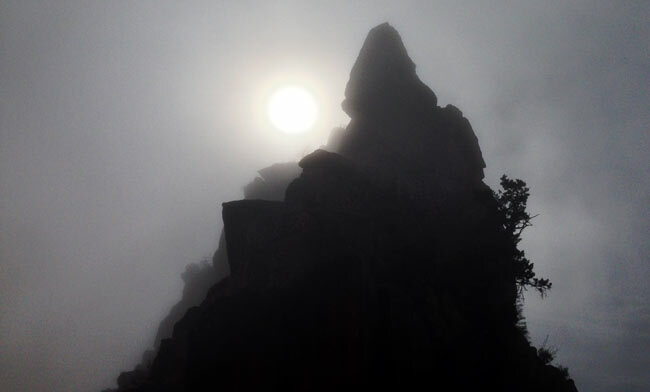 Earlier in the day, O’Neill Butte had towered above the clouds. But as the cloud level rose, it eventually became a tiny island of rock. O’Neill Butte is separated from Cedar Ridge by a saddle point. 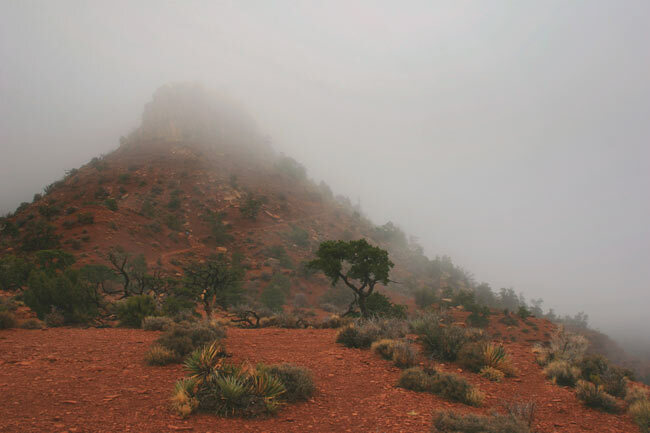 As the clouds rose and fell like surf, this saddle point was occasionally engulfed in fog. This is a photo of Cedar Ridge, taken from the saddle point. Here’s a shot of O’Neill Butte from just above that saddle point. Mormon tea (Ephedra sp.) is shown in the foreground. I shot this panorama from the saddle point after the cloud level had fallen a bit. Within minutes, the scene changed from gray fog to blue skies. Cedar Ridge is visible in the center of the picture, rising above the foreground. To the left and right is the canyon rim. The high point on the left is Yaki Point. The high point on the right is Mather Point, and farther off to the right is Yavapai Point. Beyond that, miles away, Powell Point is visible. By mid-afternoon, the clouds began to clear. As they did so, the lower reaches of the canyon began to reveal themselves. 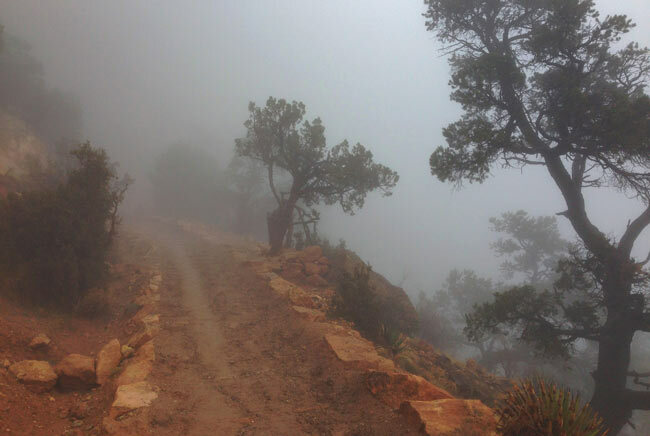 On the return hike, the clouds seemed to cling to the South Rim. Not surprising: The shade afforded by the canyon rim would have protected them from burning off. Another factor at play is the northern exposure of land beneath the South Rim. Because it doesn’t receive direct sun, it doesn’t heat up as quickly as land on the north side of the canyon. That means it releases less heat into the atmosphere, resulting in less convection, which in turn results in less atmospheric mixing — and atmospheric mixing is what breaks up the inversion layer. Back near the trailhead. The cloud layer seemed to clear from east to west (right to left). 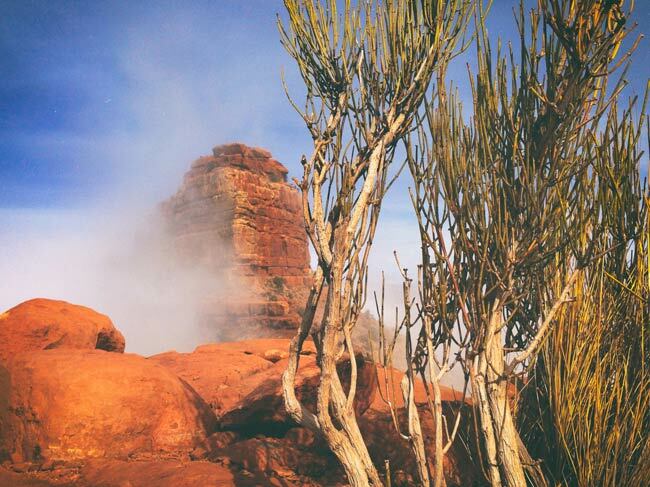 On Saturday, the clouds seemed to be spilling over the rim. The high clouds on Saturday allowed me to easily hike down beneath them. For the first mile-and-a-half, though, I was hiking within the clouds themselves. Ooh-Aah Point usually provides stunning views both up- and down-canyon. Today it provided neither. In fact, you can barely see the silhouette of a man standing at Ooh-Aah Point. 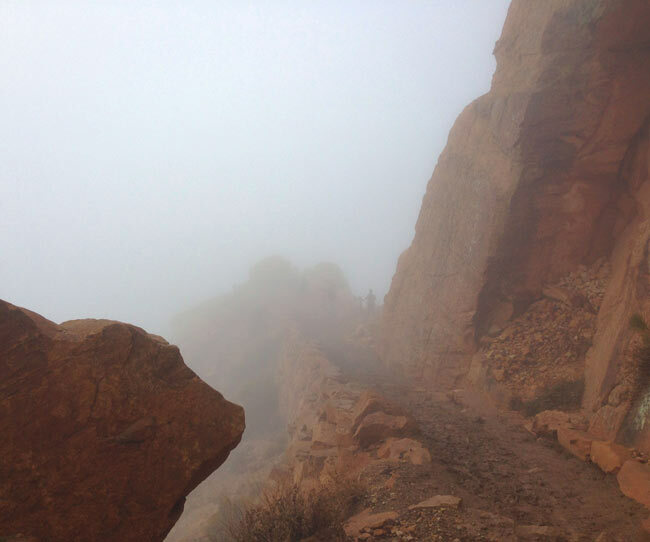 The cloud ceiling was hovering just above Cedar Ridge — when you arrived here, you got your first real views of the inner canyon. It was beautiful, like being in an aquarium made of rock and sky. Moments earlier, visibility was limited to perhaps fifty feet. But at Cedar Ridge, it was possible to see across Grand Canyon. Cedar Ridge is about 1,100 feet below the canyon rim. And the clouds were about 1,000 feet thick. From Cedar Ridge, you could see miles in one direction, but if you turned around, you could barely see the trail that you had just descended. 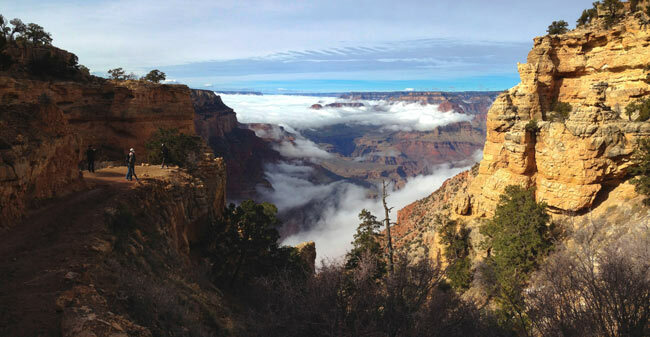 By mid-afternoon, the inversion had almost entirely cleared, revealing another layer of clouds high above the canyon. This photo was shot from Skeleton Point, three miles from the trailhead. Yaki Point is shrouded in some of the last low-level clouds to burn off, and O’Neill Butte is visible just to the right. The final half-mile of my return hike treated me to some amazing sights. When the sun hid behind the high-altitude clouds, low-level clouds would come rolling in to fill the upper reaches of Pipe Creek Canyon. Then, when the sunlight returned, they would quickly dissipate. All in all, it was a beautiful day on the trail. We had the good fortune to experience this several years ago. Your pictures bring back fond memories. Glad you liked the photos, Dave. Even happier that you’ve had a chance to experience this firsthand. It really is unforgettable!